Promix Vegan Protein Powder - Read This Review Before Buying! Promix Vegan Protein Powder is the go-to protein product for many people embracing the ever-growing plant-based diet culture. This protein powder claims to be the perfect option for vegans who want to gain muscle and improve performance by boosting their protein intake. In this article, I’ll be noting the key points about Promix Vegan Protein Powder that you need to know before making your purchase decision. I’ve also provided the online deals for buying Promix Vegan Protein Powder as well as my recommendation about this seemingly ‘high-quality’ vegan protein powder. 1 Why Are Protein Powders Popular? 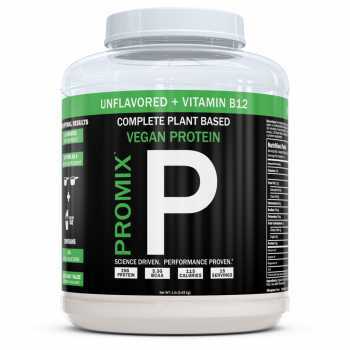 2 What Is Promix Vegan Protein Powder? 6.1 How To Get The Most Out Of This Vegan Protein Powder? 9 Where Can You Buy Promix Vegan Protein Powder? Why Are Protein Powders Popular? People use protein powders to supplement their body’s need for protein to promote muscle gain and improved performance. And while you can get protein from your diet, it’s easier to get protein concentrate from supplementation. This is also why you don’t see professional bodybuilders and athletes skipping their regular protein shake. As for the vegan diet, Whey protein powder is out as it’s made from milk. So, scientists found a vegan-alternative in peas and brown rice as a source of protein. However, the biggest issue with vegan protein sources is that most aren’t complete proteins, except soy protein. And since a significant percentage of the population is allergic to soy, the next best option is to combine two or more ingredients to create a complete protein source. Products like Promix Vegan Protein Powder contain protein sourced from organic peas and organic brown rice to do just that. Additionally, these products don’t have to deal with allergens and can be made without gluten and soy. What Is Promix Vegan Protein Powder? Promix Vegan Protein Powder comes in four flavors and provides a highly bioavailable protein source that is vegan and paleo-friendly. This easily digested protein powder is made without enzymes or hexane using a 100% mechanical process for minimal nutrient loss. It’s one of the most popular vegan protein products available online and sold around the world to thousands of users. The Unflavored vegan protein also contains 200% of the daily value of Vitamin B-12 per serving. This vitamin supports the health of your nerves and blood cells. It also promotes metabolism and improves physical performance. Peas are known to be a highly bioavailable source of protein with around 20 grams of protein per 100 calorie serving. They are also rich in vitamins A, D, E, and K. Peas also contains several amino acids like Arginine and BCAAs. While most other products contain lower quality Chinese peas, the peas in Promix Vegan Protein Powder are organic and sourced from US-farms. The protein is also independently tested for Benzoated Peroxide which indicates chemical process using bleach. Brown Rice contains 37% of the total proteins and essential amino acids your body needs. This includes BCCAs like Valine, Leucine, and Iso-Leucine which provide the benefit of promoting muscle gain. Sprouted brown rice protein should be the preferred choice for men and women who are sensitive or allergic to whey, egg, or soy. The mechanically processed brown rice is separated into its plant-based protein form which is blended with the organic pea protein to provide a complete amino acid profile. Methylcobalamin is the most bioavailable form of Vitamin B12 available in the market. This supplement uses 100% non-synthetic and non-GMO version of this vitamin which is often missing from most vegan diets. This Non-GMO Vitamin B12 provides your body with the Vitamin B12 your vegan diet is missing. It also helps prevent anemia while improving workout performance. Promix Vegan Protein Powder is made from organic pea and sprouted brown rice which contains all nine essential amino acids. This makes it a complete protein source your body can use to promote muscle gain. The essential amino acids include Histidine, Isoleucine, Leucine, Lysine, Methionine, Phenylalanine, Threonine, Tryptophan, and Valine. One of the biggest selling points of this protein powder is that it’s 100% mechanically processed instead of chemically processed. The mechanical process doesn’t require bleach or other chemical solvents to separate the starch and other content from the protein in the peas and rice. The BCAAs that are part of the pea/rice protein blend includes Isoleucine (1300 mg), Leucine (2500 mg), and Valine (1500 mg). These branched-chain amino acids can promote muscle growth, reduce muscle soreness/fatigue, and prevent muscle mass loss. It’s said to contain 25 grams of protein per 29-gram serving. So, Promix Vegan Protein Powder provides a protein yield of 86%. Both peas and brown rice are well-known as high bioavailable sources of protein. What this means is that your body is better able to absorb the protein that you are ingesting. So, if you were taking a supplement with low bioavailable protein, your body would benefit from less protein as compared to a product with high protein bioavailability. This protein powder is made with organic and vegan-friendly ingredients. This means that this supplement doesn’t contain any gluten, soy, dairy, or GMOs. Those on a paleo diet can also enjoy this protein powder without disrupting their macronutrient ratios. It also uses organic North American peas and doesn’t contain artificial sweeteners either. 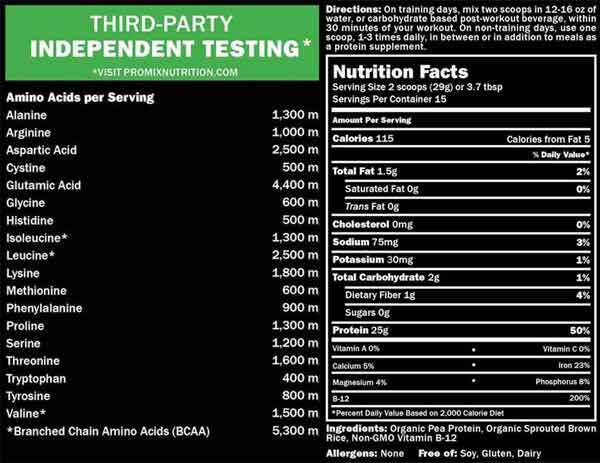 According to the official site, each production batch of Promix Vegan Protein Powder is independently tested by a third-party. The protein is tested for Benzoated Peroxide which is a residue left after chemical processing using bleach, acids, or enzymes. The manufacturers of Promix Vegan Protein Powder are confident that you will be happy with your purchase. So, they have introduced a 30-day money-back guarantee that provides you a full refund if you’re not satisfied with the product. Additionally, you can also get free shipping if your order is over $40. The makers provide access to registered dietitians and team trainers to help you get the best out of your vegan protein. They are available to answer your questions and provide guidance to maximize your performance and results during training. Promix Vegan Protein Powder is made in the US and supports sustainable farming initiatives to promote home-grown produce. The production and packaging facilities used are USA GMP-certified to deliver a high-quality product. The slogan for Promix is ‘Pure Ingredients. Pure Results.’ and it shows with the ingredient selection and customer feedback. The official site has a 4.5 rating with over 128 reviews with the supplement getting 123 reviews on Amazon. Unflavored Vegan Protein Powder comes with added vitamin B12 that’s simple, yet effective at boosting muscle gain and performance. Raw Chocolate Vegan Protein Powder contains four natural ingredients for a tasty protein shake that promotes lean muscle mass. Organic Pea Protein only contains organic peas to provide an undiluted muscle-building protein source. Firstly, start with your base which can be water, almond milk or anything you chose to use. You should use 12-16 Oz of the base. Just add it to your shaker bottle or blender. Secondly, add two scoops of Promix Vegan Protein Powder to the base and shake/blend until you get a smooth consistency. Thirdly (optional), add some fruits or veggies and blend them into your protein-packed drink. Fourthly, drink it 15 minutes after your workout. This will supply your protein-deprived body with the fuel it needs to build muscle mass. Fifthly (optional), you can also take this whenever you feel like as an all-purpose protein supplement. How To Get The Most Out Of This Vegan Protein Powder? If you want to get the most out of this supplement, you need to take the powder post-workout. This, along with a rigorous workout routine will give your muscles the ability to grow and bulk up without issue. Additionally, note that you don’t have to be a vegan or vegetarian to take this product. However, following a vegan diet while using this product may provide faster and more effective results. 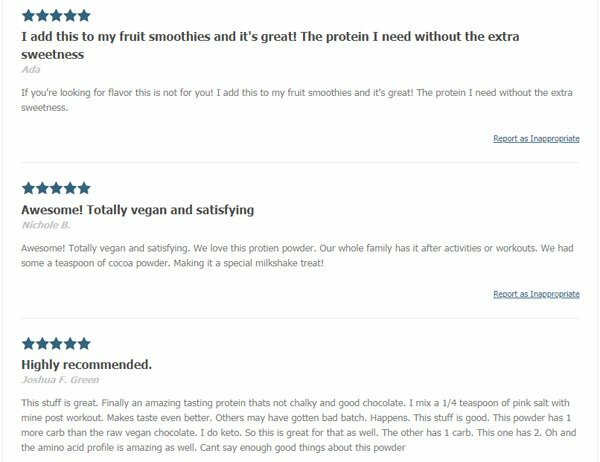 Checking online, people have nothing but good things to say about Promix Vegan Protein Powder. That is to say, this protein powder seems to be exactly what many people with allergies or sensitive stomachs were looking for. 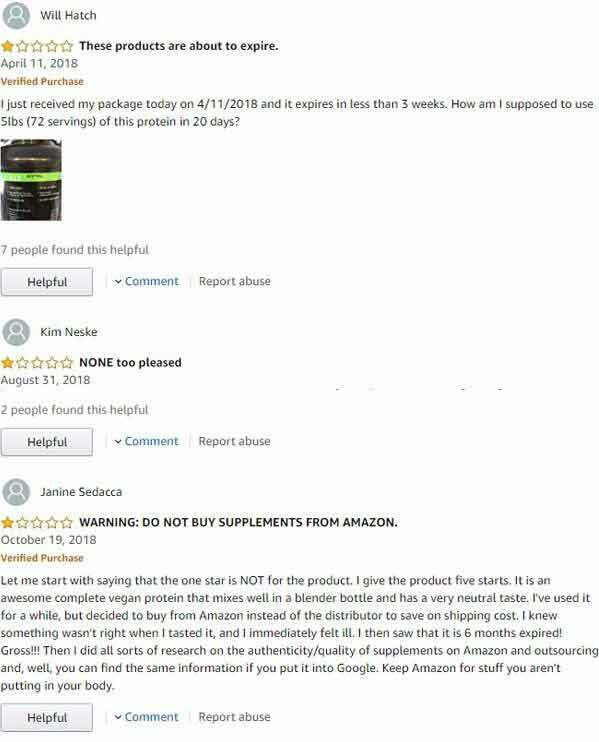 I didn’t find even a single review or testimonial that indicated this vegan protein powder to cause side effects. This may be due to the high quality of the product that is made in US-based GMP-certified facilities. That said, I did read a few comments that mentioned that the taste of the unflavored vegan protein powder wasn’t the best. It’s also why many people (me included) would suggest you take Promix Vegan Protein Powder in a smoothie instead of using water. Where Can You Buy Promix Vegan Protein Powder? Promix Vegan Protein Powder is one of the next-gen exclusive online products. I found it was available on Amazon as well as on the Official Promix Website. But the cost on both sites is the same. So, instead of buying it on Amazon, I recommend you buy it directly from the manufacturer’s site. This will ensure that you get fresh stock while being eligible for their 30-day full money back guarantee. You can also get this product on a subscription basis which comes out to be 10% cheaper (on all orders). All you have to do is instruct the manufacturer to deliver the product every 1, 2, or 3 months when you are ordering the product of your choice. Promix Vegan Protein Powder is a supplement that helps men and women on a vegan diet to gain muscle mass. In fact, the special care for quality seems also to be passed to the after-purchase service with access to their registered dietitians and team trainers. When combined with the affordable price tag, makes Promix Vegan Protein Powder a desirable choice for vegan protein powder. So, if you are considering taking the next step towards improving your physique while on a vegan diet, get Promix Vegan Protein Powder from their official site. In addition, my favorite flavor is their new Chocolate Vegan Protein Powder which comes in tub and sachet-form.